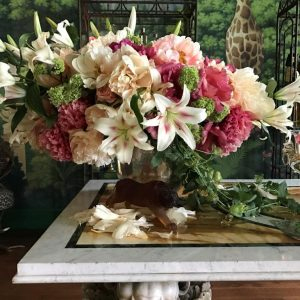 With the extreme heat of the day, this gorgeous bouquet in Ken Fulk's magical dining room was succumbing, petal by petal, to exquisite decay. I had not been to Kips Bay in years. I don’t, however, believe that abstinence triggered my overwhelming desire to visually consume each room with mindful gusto. The inspiration I felt in every cell of my body was due to being up close and personal with some of the very best unrestrained interior decoration in the world. I meandered up and down, inspecting details, lingering. Beyond the many obvious wow moments, I honed in on some very cool and practical interior design ideas. Here are 10. Richard Mishaan’s Parlour Room was exquisitely layered to the nines. In a still life that (to me) evoked Iris Apfel, the designer dressed bottle and vase necks with colorfully strung baubles. A chic way to show off a beautiful collection that could have otherwise been kept in a private dressing room, these beaded works are now public eye candy. In Kirsten Kelli’s spacious living room, a pair of blue and white upholstered club chairs flaunt an unexpected Sid Vicious-style trim. As if the spiky embellishment isn’t enough of a surprise, its strapping placement is also edgy. This design pairing celebrates the bond between fierce and fresh. When you transition from the 3rd to the 4th floor at Kips Bay, the experience is rather stellar thanks to Timothy Brown Studio, and his exciting carpet design underfoot and the uninterrupted application of a yummy taupe block-printed wallpaper along walls, moldings, doors and coves. Carpet Installation: Sacco/Wallpaper: Adelphi Paper Hangings. When I saw the window shade in Neal Beckstedt’s Attic Sitting Room, with its contrast fabric band, I was reminded of the color-blocked draperies that are constructed from yardage of two or more fabrics. Curtains are a lovely way to introduce a new color, pattern, or texture and to utilize that awesome textile remnant you brought back from your last adventure. 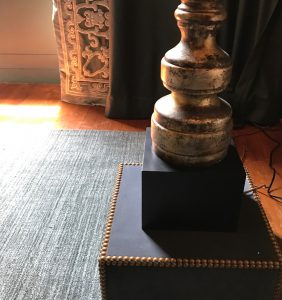 When I spied the base of this floor lamp in interior designer Susan Ferrier’s bedroom, I wondered whether the base was original to the design or had been added to make the lamp taller. Whether the lamp was born with the platform or not, adding a base is a simple way to give a lamp a more commanding presence. 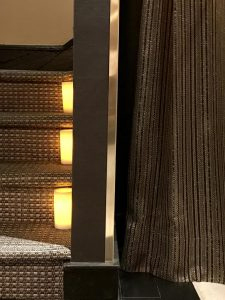 Though I suspect the staggered LED candles were more of a safety resort than an intentional design statement, they perfectly lit the way down to Lichten Craig’s chic and somber lower-level lounge. Emitting just enough glow to illuminate the treads, I loved this practical, energy-saving, and somewhat romantic way to light the path to a very special destination. The Kips Bay Decorator Show House, 125 East 65th Street, NYC is open through Tuesday, June 6th. Don't miss it!